OEM-OPTICAL offers a wide range of X Y stage motion products. The choices include coaxial drive microscope stages, motorized stages, and precision lead-screw measuring stages for toolmaker systems. All stage designs can be upgraded to digital readout capability in a variety of precisions. We also offer upgrades to your existing microscopes for measurement in X/Y/Z as well as rotation (theta). In addition, we work closely with our X Y stage manufacturers and can provide custom designs and XY travels to your specification. Contact us for details. 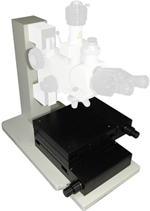 Precision coaxial drive microscope stages in sizes from 4”x4” travel to 12”x12” travel. Variety of stage options. 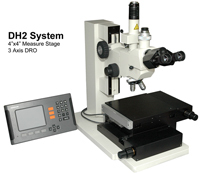 Digital readout systems and retrofits for all microscopes. Measure X / Y / Z / Theta with a wide range of precision levels.